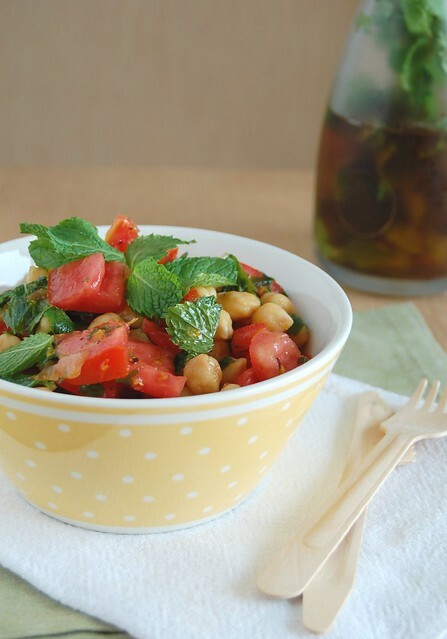 Again, mint is the refreshing agent around here – I never knew it would go so well with tomatoes. Just delicious. In a large skillet, heat the olive oil over medium-high heat. Add the onion and garlic with a little salt and sauté for 1-2 minutes. Add the chickpeas and cook until they are dry. Remove from the heat and allow to cool to room temperature. Before serving, gently toss in the tomatoes, lemon zest and juice, pepper flakes, mint, parsley, and season with salt and pepper. Drizzle with extra virgin olive oil and serve. I'm saving this one for the summer, when the mint runs wild in my garden. This is gorgeous and indeed savory! What a beautiful salad! Love the colors! I love any salad with chickpeas! Beautiful photograph! And all the pictures in your blog are splendid! Yummy, yum, yum! This is my kind of salad. Patricia, I love the color combination, the freshness of the tomatoes and the chickpeas. My husband would kiss me if I made him this! Explora Cuisine, thank you! The mint adds a very fresh note. Lydia, I hope you like it, sweetie! Kankana, thank you for stopping by!